Dutch painter, etcher, and writer on art, the second son of the painter Reinier Lairesse and Catherine Taulier. He was the leading decorative painter in Holland in the second half of the 17th century, working in an academic classical style that inspired his over-enthusiastic contemporaries to call him the Dutch Raphael and the Dutch Poussin . In 1660, he spent a brief period in Cologne, where he is said to have painted a Martyrdom of St Ursula. Local artists were apparently envious of his success and he was forced to return to Liège. Commissions came pouring in. In April 1664, however, he was compelled to move once again. A contemporary gave the following account of the circumstances surrounding his hasty departure. 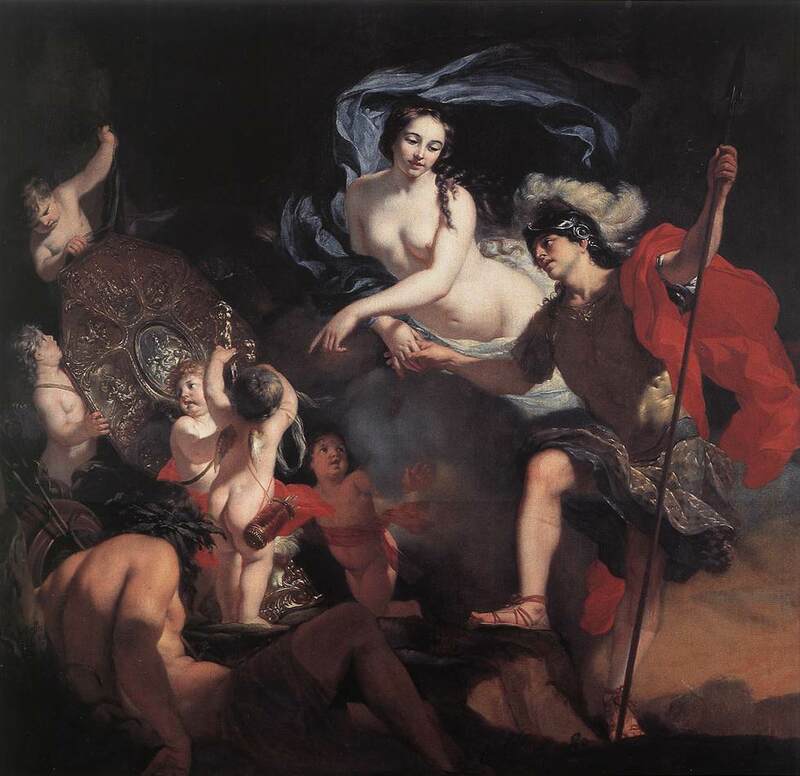 Earlier that year, Gerard Lairesse had formed a friendship with two sisters from Maastricht, Marie and Catherine Franois, one of whom was assez belle , the other fort virile et courageuse . Lairesse gave his word in writing that he would marry one of the two. His parents, however, were opposed to the match and made arrangements for him to marry Marie Saime, the cousin of Gerard s brother-in-law. On 22 April, the Franois sisters set up an ambush to take revenge. One stabbed Gerard in the back with a brand-new knife, in response to which he drew his sword. His assailant, however, had a sword as well. 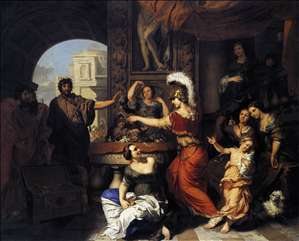 Lairesse delivered a blow and the two sisters fled to a pharmacy. 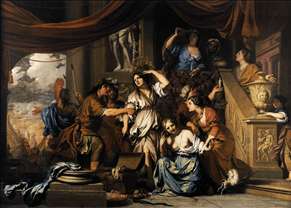 Lairesse, with wounds to the chest and his partie honteuse, sought refuge in a Dominican cloister. As soon as he had recovered, he and Marie Saime eloped to Maastricht and were married en route in Navagne. The couple made their home in Utrecht, where their first son was christened in a Catholic church on 5 April i665. Rembrandt had painted a portrait of the young Lairesse in 1665 (Metropolitan Museum of Art, New York), sympathetically showing his disease-disfigured face. Lairesse was soon discovered by the Amsterdam art dealer Gerard Uylenborch. According to Houbraken s account, the very day he set eyes on paintings by Lairesse, Uylenborch set off for Utrecht so that this hare would not elude him . To show Uylenborch what he could do, Lairesse produced a painting of a Child, the Virgin, Joseph s face and the head of an ox in no more than half a day - pausing between times to take up his violin to gain renewed inspiration. Lairesse worked for Uylenborch for several months before resigning to start his own shop . He built up an extremely productive and successful studio. 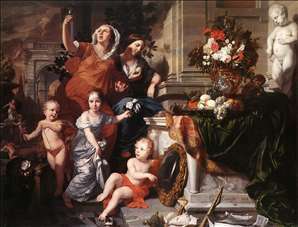 A group of scholars and intellectuals headed by Lodewijk Meijer and Andries Pels, who had adopted the motto Nil volentibus Arduum , convened in Lairesse s home. Lairesse made illustrations based on some of Pels s plays, such as Didoos doot and Julfus . He also produced illustrations for an authoritative text on anatomy written by Govert Bidloo. His patrons included the Stadholder William III as well as prominent Amsterdam regents such as Andries de Graeff, Nicolaes Pancras and Philips de Flines. Lairesse also received commissions from public institutions such as the Poorhouse and the Lepers Hospital. 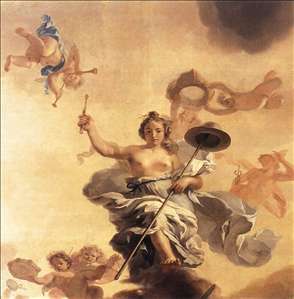 In addition, he painted decors for Amsterdam s municipal theatre. Lairesse s eyesight began to fail towards the end of 1689 and he went blind the following year. This left him with no alternative but to derive an income by giving lessons in art theory. With the help of his sons he published his teachings in Grondlegginge ter teekenkonst (Foundation of Drawing, 1701) and the Groot schilderboek (Great Painting Book, 1707). Both volumes proved highly influential and appeared in numerous translations. Lairesse died in his home on the Prinsengracht, and was buried on 28 July 1711. See more details about "Allegory of the Five Senses"
See more details about "Allegory of the Freedom of Trade"
See more details about "Diana and Endymion"
See more details about "Achilles Discovered among the Daughters of Lycomedes"
See more details about "Venus Presenting Weapons to Aeneas"